North Idaho Propane was beyond our expectations. We appreciate you! Thanks! North Idaho Propane, Inc. is a locally owned and operated company with trained, licensed and experienced service personnel. We have been servicing farms, homes, and businesses in the North Idaho area since 1990. When you call, you get a local person ready to serve you—not someone in a different town. No touch tones, just old fashioned service—plain and simple. We know how much good service means to our customers. 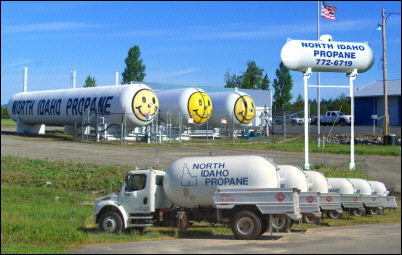 North Idaho Propane was started by Jim Green, who had years of experience in the industry. Since his passing in 1999, the family has kept the business going with the help of an excellent crew. We are very proud of our crew, consisting of ten hardworking individuals who are the backbone of the company. North Idaho Propane currently services most of the Northern panhandle of Idaho as far north as Bonners Ferry and as far south as Plummer. (View our delivery area map). We are located just off of Highway 95 at 54159 N. Old Highway 95, Hayden.